I guess it’s the cheapest, quickest way to get exercise? And you don’t have to be THAT coordinated? What’s your favorite thing about running? I get a lot of thinking done when I’m running. I don’t run with music or podcasts, so I just kind of notice the world around me and let my brain work on stuff. I actually came up with a new idea for my school last year during runs, figured out the small details in the shower, and now it’s a real program that has helped us improve our students’ math skills! I also like how clearly you can see progress over time. It’s satisfying. Definitely my stomach. 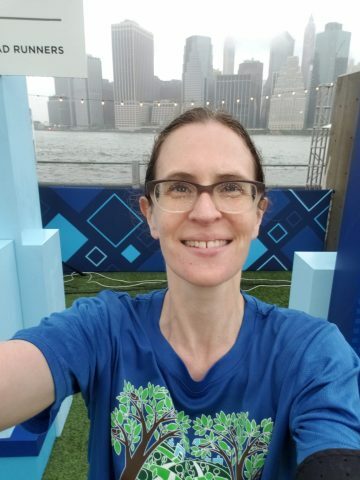 I’ve really struggled with stomach issues in big races… I used the portapotties something like 5 times in the first 3 miles of the Brooklyn Half. Ugh. Why did you join CHRC? Aliza recruited me before the R-U-N 5K in Prospect Park last year, and it seemed like a friendly group that might be helpful as my training increased. What’s been your favorite CHRC run/event/activity and why? The Dyker Heights Christmas Lights run! I would never have thought of it, and even if I had, I wouldn’t run at night in the winter alone, so it was totally different from my normal routine and super fun. It also happened to be my longest run ever at that time! I love the Jingle Bell Jog. It’s in our neighborhood, supports kids, and it’s fun. It’s also often the end of regular training for me since I don’t run as consistently in the winter. Lots of people I know run it or come out to cheer, and all the bells are ringing as we run, and people are in Christmas costumes. I ran it when I was 8 months pregnant – it was my last run before my daughter was born. I rocked a Santa Claus belly and then some! What upcoming races will you be doing? My first marathon on November 4th, and the Jingle Bell Jog, and then we’ll see. What’s something you love to do when you’re not running? Family time & reading… friend me on Goodreads if you’re a literary fiction or popular nonfiction enthusiast/snob!